Some of the goods we use in our everyday life seem harmless: hair sprays, lithium batteries, perfume, matches… However they may be very dangerous when transported by air. For your own safety, and to avoid potential fines, it is very important that you carefully read the dangerous goods information provided by your airline before your flight. Lithium batteries are contained in many items of frequent use. Your cell phone, your laptop, tablet or even camera are powered by rechargeable lithium-ion batteries. When damaged, short-circuited or overheated, these batteries can catch fire. You should carry your portable electronic devices (PEDs, such as cameras, laptops and phones) in your hand baggage (carry-on), and not in your checked baggage. Under normal circumstances, we can use our laptops, eReaders, tablets or MP3 players on board for working, reading, listening to music or watching movies. Even our cell phones can be used on most airplanes for i.e. playing simple games. However, keep in mind that PEDs may interfere with the airplane equipment and this differs from one type of aircraft to another. This is why airlines require to switch them to “airplane mode” at all times. 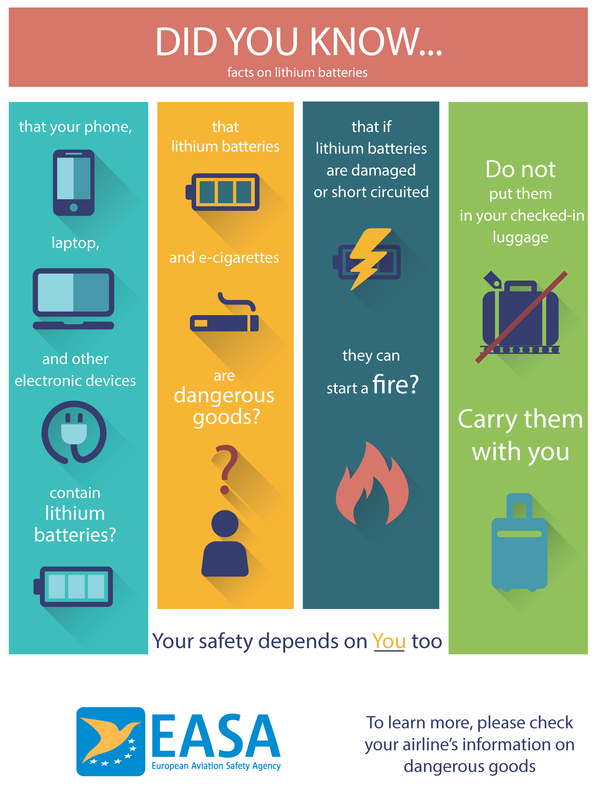 Here you will find more practical information on lithium batteries, how to carry and pack them, and how to react if your device gets too hot, or also if it gets lost in the cabin. Electronic cigarettes (e-cigarettes) contain a battery and a heating element that vaporizes a liquid vapour to simulate tabacco smoking. Several incidents were reported to the International Civil Aviation Organization (ICAO) involving e-cigarettes overheating resulting in a fire in checked baggage. For this reason, these devices can only be carried in the cabin, and it is forbidden to recharge them while on board the aircraft. See Safety Information Bulletin on Fire Risk of Electronic Cigarettes in Checked Baggage (SIB 2015-06R1). Small lithium battery powered personal transportation devices, also known as hoverboards, self-balancing devices or gravity boards, were one of the most sold devices recently. However, there have been incidents where these items or their batteries overheated, caught fire and even exploded. Passengers are not allowed to carry these batteries in their checked bag, as batteries have a rating of 100 Wh or more. Because of the high risk posed by these devices, many airlines have decided to additionally restrict their transport in the cabin. It is therefore safer to leave these items at home when flying. See Safety Information Bulletin on Carriage of Personal Transportation Devices (SIB 2016-04).